Today’s photo comes from 2017, when we were on our way to Hawaii via San Francisco. However, it’s a photo of territory I frequented far more often in my earlier years. You can see the Oakland Coliseum, my home away from home during my first 19 years of life, in the very center of this photograph. The “island” in front of Oakland (now actually attached to Oakland, yet part of Alameda, thanks to landfill) is Bay Farm Island, and the San Leandro Bay is the water between the two. We used to drive up Doolittle Drive on Christmas Eve every year to eat at Alameda’s Acapulco restaurant. I also rode my bike up Doolittle to the stadium sometimes. My house was a few miles to the right of this photo. 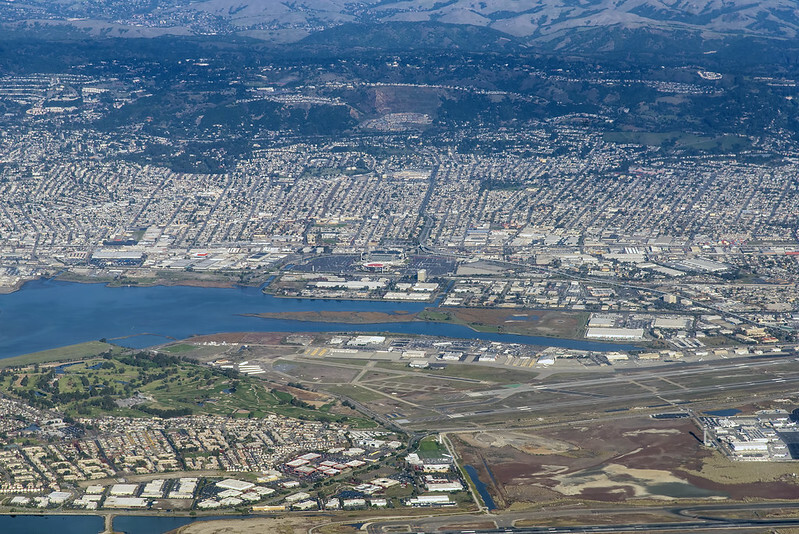 You can also see some of the runways for the Oakland Airport in this photo. Fun fact: the Oakland Airport was the first airport in the continental U.S. to offer flights to Hawaii. My first flight to Hawaii was from Oakland, but my flight on this day was out of SFO.